On a bit of a recipe roll from yesterday, I thought I'd post up last night's meal with photos. 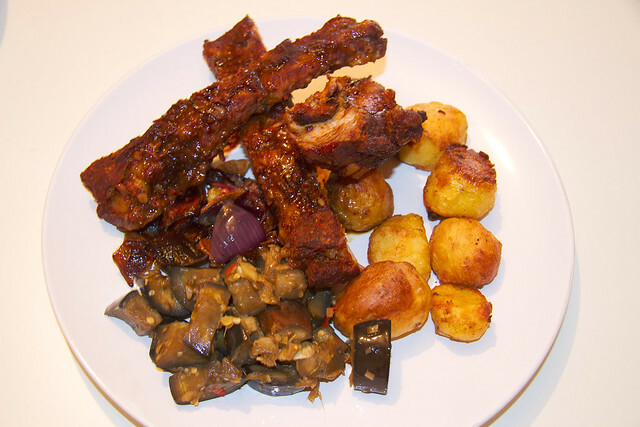 In Galicia churrasco (spare ribs) is one of the meaty alternatives to the fine seafood on offer, but I never much liked the way it was cooked - relatively quickly on a hot grill, which leaves it tough and a challenge to rip off the bone. I'm all for interesting textures in food (pure cartilage and extremely fatty cuts where two of the new textures that I grew accustomed to in China), but in the case of ribs I'm definitely in the long, slow cooking camp. I came up with the following recipe for spare ribs a year or so ago and have been trying to perfect the timing and heating ever since. Last night was a pretty good success. The marinade is made of several parts, the first being the base sauce used to make kimchi and can be found here. I would recommend going the whole hog and making the kimchi while you're at it. I normally do enough of the sauce to fill a couple of big tupperware containers and then add it in generous quantities to most recipes for the following months. It seems to keep, in the fridge for at least three or four months without a problem - it may last longer but by that time it's already been used up in my place! Take two or three generously heaped tablespoons full of the kimchi paste and to it add honey, soy sauce, gochujang, and I normally throw in another few chunks of garlic which caramelize on the ribs. I'll leave the ratios up to you, depending on how sweet or spicy you like it. 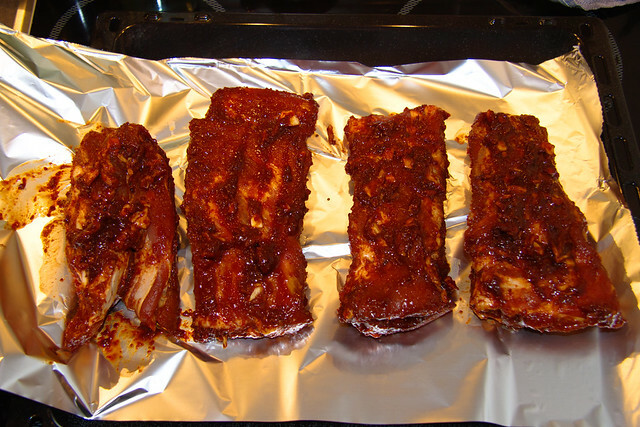 Take the ribs and rub in the sauce with your hands - they need to get a good massage to get the sauace everywhere. Then marinate them for a few hours in the paste (I'm still not sure how much the marinating does, given the time that they have in the oven anyway). Heat the oven to around 80 degrees, wrap the ribs in silver foil securely so that the moisture can't escape and put them in the oven. I normally give them about 4 hours or so at 80 degrees and then for the last half hour I take them out of the silver foil turn the heat up to around 170 and get them caramelizing on the outside. Slow cooking them leaves them moist and tender, so you have to be careful not to dry them out in the last stage. By this time they should be falling off the bone. In fact, it may be better to do them for longer, at closer to 65 degrees, but this would probably bump the time up to more like six or seven hours which I can't usually spare. This time I did them with garlic roast potatoes - I would normally add some rosemary and thyme to the potatoes but didn't have any fresh. The potatoes are boiled for around ten minutes, then bashed around violently in a pan to get the outside floury. Then coat them in a pan with a little butter and olive oil with salt, onions and garlic. The ideal is then to cook them on a high heat for about an hour and a half, but with the ribs cooking slowly I had to adapt a little and gave them a good 15 minutes extra at the end on around 200. The aubergine was stirfried, after salting, in a mixture of garlic, ginger, one red Birdseye chilli, a dash of soy sauce and fish sauce, an inch of lemongrass and a squeeze of lemon, all having been crushed in a pestle and mortar. Slightly unfocused, but here was the final result.